The past couple of posts I made were regarding living near the water. As a young kid we lived near Lake Michigan. As a teenager I lived in North Carolina. Though the beaches in North Carolina were hours away from where we lived, it was still exciting to live in a state that had a coastal region. After graduating I began a life in the hotel industry, which pulled me away from the oceans for over ten years. My career took me to Nebraska, Arizona and Nevada. Finally I was transferred to California and I was excited to be back to a state that sat on the ocean. I moved around California for some time before my husband, Maurice, and I settled in the Los Angeles South Bay. Finally I live in an area where there are numerous beaches.If you are a regular reader of this blog, then you know that hands down my favorite is Hermosa Beach. Sure, there’s Redondo Beach, but I find the Pier is total chaotic and not very pleasant. The Beaches themselves are small and tend to have a lot of disgusting seaweed rotting in the sands. Then there’s Manhattan Beach which I find pretentious. Older beach houses are being torn down and replaced by large masonry built homes that don’t fit in a beach community. At least that’s my opinion. I also find their downtown area next to their pier to be more upscale than I’m interested. Hermosa Beach is not pretentious. Their shopping and dining plaza is just plain fun for ordinary folk. Even though I don’t live in Hermosa Beach, I still consider it home. For three days now I’ve been posting about lakes and oceans and how I am drawn to them. So what’s it all about? Why make such a big deal? It’s a big deal because of serenity. When my insanity was at it’s absolute worst, When I never wanted to leave home, when I’d run out of buildings because I couldn’t handle all the hustle and bustle, when I could hardly communicate, when it physically felt like the entire world was spinning, Maurice could always bring me down to the beach and everything would be okay. The knots that were always running across my back shoulder to shoulder would practically melt away. I think happiest for Maurice and I is that it was the one place that he knew we could talk without me becoming confused and annoyed. We could actually have a conversation. Maurice is not fond of seagulls. In fact, he hates them. He hates them as much as he hates pigeons. “Rats with wings,” is what he calls them. I, on the other hand, love them. I’m no big fan of pigeons, but I love to watch the seagulls. I am mesmerized watching them using the winds to hover over one place and sometimes using their feet to change directions. While they are scavengers, just like pigeons, their beauty and their gracefulness help me to relax and sooth my brain. Pelicans are what we enjoyed together. We would watch how beautifully they would fly and then laugh when one of them would suddenly dive bomb straight down in the water to catch a fish. We would watch them for hours together, each of us guessing by their movement which one was going to dive bomb next. They were the rare moments that I could actually laugh. They were the rare moments that I even cared if I did laugh. We don’t go down to the beach together as much as we use to. 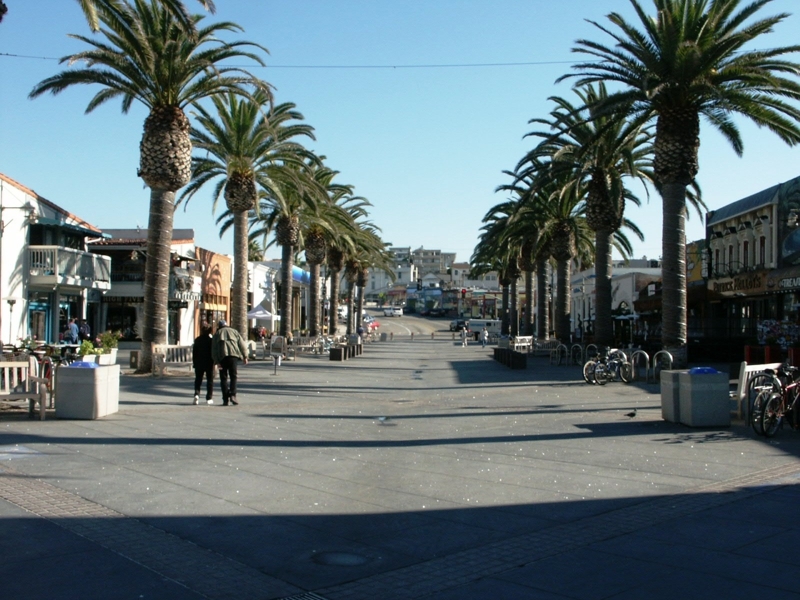 We have a standing date every Saturday morning to go down to Hermosa and walk along the strand for exercise. Unfortunately life sometimes gets in our way and we are unable to go. However, on the weekdays, when I have time, I love to go for long walks. I believe those long walks have been the major contributor to the 90lbs that I have lost. Talk about a compelling reason to go to the beach. So there you have it. I didn’t take the opportunity to work on a shrimp boat. I turned down purchasing a sandwich shop on a tiny island. I didn’t buy a sailboat to travel around the coast for several years…but I do have Hermosa. Hermosa Beach doesn’t look special, it’s not exciting, tourists from around the world don’t come to Los Angeles to see Hermosa Beach. But, I am not being over-dramatic when I say that Hermosa Beach saved my life, or, at the very least, made my life worth living. As much as we enjoy it today we are certain we don’t want to stay in LA forever. Who knows where life will take us, but Maurice and I hope to eventually retire along the coastline somewhere. It won’t be Hermosa Beach, but Hermosa will always be on my mind. Everyone is different, so I’d like to hear from all of you. What is it that calls you?